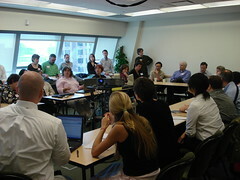 The library unconference is fast becoming a fixture in the assortment of library-related gatherings. Having been a facilitator of two previous Library Camps in Ann Arbor and Darien, it was a pleasure to let someone else do all the heavy lifting and simply enjoy the fruits of their labor! Many thanks to Stephen Francoeur, Linda Rath, Louise Klusek (the kind folks from Baruch), Rachel Watstein (IBM), and Steven Kaye (Accenture). Attendance at Library Camp NYC was quite large (100+ people!) which certainly tested the open spaces concept. The 14th floor of Baruch’s vertical campus building was well equipped to handle the crowd, however, and a number of really great sessions were spawned. The only drawback of the unconference format, I’ve found, is that I always find myself wanting to be in two or three places at once. You can take a look at how the final program evolved on the event wiki. During the first session, I attended ‘Library 2.0 show and tell‘ which focused a lot on wikis and some other specific technologies. The group also touched on topics such as how to get staff/patrons to buy-in to new services. I also attended a session led by OCLC’s Eric Hellman on their grid services concept (xISBN, etc). I think I enjoyed the final session the most, however, which was a discussion about cataloging and Weinberger‘s Everything is Miscellaneous. A great day, and I’m sure we’ll see more library camps in the future. Thanks for blogging this. It helped remind me about all the stuff I saw that day!